*Pulled up when well fancied for the Goffs Thyestes Handicap Chase at Gowran Park in January 2018, a race in which he finished second to Champagne West in 2017. *Returned after over eight months off to finish second to subsequent Timico Cheltenham Gold Cup third and fellow Randox Health Grand National contender Anibale Fly in the Paddy Power Handicap Chase (3m 1/2f) at Leopardstown over Christmas. *Runs off a mark of 147 in this year's Randox Health Grand National, his third attempt in the four and a quarter-mile £1-million contest, but has yet to win a race for trainer Gordon Elliott. *Unseated his rider at the 22nd (Bechers Brook second time around) in last year's Randox Health Grand National off a 2lb higher mark of 149. *Excellent sixth in the 2016 Randox Health Grand National off the same rating of 149. *Notable efforts last season included finishing a close fourth in the G3 Randox Health Becher Handicap Chase over the Grand National fences at Aintree in December, 2016 and fourth to Abolitionist in the valuable Leinster National Handicap Chase at Naas on March 12, 2017. *Half-brother to multiple G1-winning chaser Silviniaco Conti. *Trainer won the 2007 Grand National with Silver Birch in his first season with a training licence and saddled the runner-up Cause Of Causes last year - all from 13 Randox Health Grand National runners in total. Simon Munir was born in October, 1964, and educated at Harrow, where subsequent Flat trainer William Haggas was a friend. He lives in Hertfordshire. He hoped to play for Arsenal when younger and is still an enthusiastic supporter of the team, with a box at the Emirates Stadium. The CEO and one of the founders of Galaxy Asset Management in 1999, he previously worked for Merrill Lynch, based in Geneva for 10 years, and then ran its Monaco operation. He is also a board member of Pladis, the global snacking company. His first horse was No Speeches, owned in partnership with four colleagues, and a winner on the Flat for them at Lingfield in 1996 when trained by Simon Dow at Epsom. He sponsored Jack Berry's yard and has had horses with Haggas and Sir Mark Prescott before upping his involvement in Jump racing. His first major winner in that sphere was Soldatino in the 2010 JCB Triumph Hurdle. In recent years, Munir has owned horses in partnership with Isaac Souede. The American was heavily involved for 30 years with the London-headquartered Permal Group. Souede was most recently chairman and chief investment strategist at Permal which merged with EnTrust in 2016. He was largely responsible, in his various roles as CEO and CIO, for the creation of the investment processes and the growth of the business from $450 million to $20+ billion when it was sold to Legg Mason in 2005. He was also general partner of Ann Arbor Partners LP, a principal investment firm based in the United States. In May, 2017, it was announced that Souede had joined San Francisco-based alternative asset manager SCP Investments as chairman and chief global strategist. He is based in New York and works alongside SCP founder and CIO, Sandy Colen, managing a segregated portfolio expressing his top down views using stocks and ETFs. Souede was educated at the State University of New York and the University of Michigan, before becoming an accountant. Both Munir and Souede have invested heavily in young horses, mostly bought by their racing manager Anthony Bromley of Highflyer Bloodstock. They have horses with trainers including Nicky Henderson, Alan King, Nigel Twiston-Davies, Harry Fry, David Pipe and Oliver Sherwood, Ben Pauling in Britain, and Willie Mullins and Gordon Elliott in Ireland. They also have a sizeable team of horses in France, principally with Guillaume Macaire, Guy Cherel, Jacques Ortet, Yannick Fouin and Guy Henrot. They retain Daryl Jacob as their jockey. Their green colours have been worn by Top Notch, Edward D'Argent, Wholestone, Messire Des Obeaux, Bristol De Mai, Sceau Royal, Footpad, Peace And Co, Vyta Du Roc, Wholestone, We Have A Dream, Terrefort, Call Me Lord, Missy Tata, C'est Jersey, Ballybolley and L'Ami Serge among others. They have over 50 horses in training. Randox Health Grand National Record: 2013 Roberto Goldback (UR 30th - owned by Simon Munir); 2016 Ucello Conti (6th); 2017 Ucello Conti (UR 22nd). Born: March 2, 1978, in Summerhill, Co Meath Background: A very successful point-to-point rider, Elliott also partnered 46 winners as an amateur under Rules. He started his racing career while still at school, working at Tony Martin's stable in County Meath. He moved to Britain, joining Martin Pipe in 1997, and learnt a lot during his spell in Somerset. His biggest victory as a rider was on board King's Road, trained by Nigel Twiston-Davies, in the 1998 Punchestown Champion Bumper. After commencing handling point-to-pointers, he started his main training career from Capranny Stables in Trim, Co Meath in early 2006 and bought the 78-acre Cullentra House Farm, Longwood, Co Meath, in 2011, where the facilities have been built up from scratch, with a capacity of 200 horses, two gallops, three schooling grounds, an equine pool, a natural spa and more. The trainer has emerged over the last few seasons as the main challenger to Willie Mullins' dominance in Ireland and had a major boost when receiving the pick of 60 horses that Gigginstown House Stud removed from Mullins in September, 2016. Elliott is part of a select group of trainers to saddle a winner at both the Cheltenham Festival and Royal Ascot, having sent out Commissioned to land the Queen Alexandra Stakes at the prestigious Flat meeting in June, 2016. He also saddled Dirar to win the Ebor Handicap at York in 2010. Training Career: Elliott's first runner under Rules came at the 2006 Cheltenham Festival, when Brandon Mountain was pulled up in the Fred Winter Juvenile Novices' Handicap Hurdle. He continued to send runners over to the UK and enjoyed almost instant success, most notably with Arresting, who notched up four victories between May and July, 2006. Elliott's Grand National victory with Silver Birch in April, 2007 was remarkable not only because he was just 29 at the time, but also because he had yet to saddle a winner in his native country. 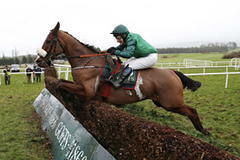 The winners in Ireland soon followed and Elliott gained an initial G1 victory with Jessies Dream in the Drinmore Novice Chase in December, 2010, and celebrated his first Cheltenham Festival successes in 2011 with Chicago Grey in the National Hunt Chase and Carlito Brigante in the Coral Cup. His Cheltenham Festival haul now stands at 22 and includes Don Cossack's victory in the 2016 Timico Cheltenham Gold Cup. He was the leading trainer at the Cheltenham Festival for the first time in March, 2017 with six successes, the same number as Willie Mullins but had one more runner-up. Elliott plundered his second leading trainer award at this year's Festival following a remarkable record-equalling eight winners over the four days, emulating Mullins' best - eight wins at The Festival in 2015. One of the most talked about horses in Jump racing, Samcro, is currently trained by Elliott and justified the hype at the 2018 Cheltenham Festival with a dominant victory in the G1 Ballymore Novices' Hurdle. Last season was Elliott's most successful as he sent out 223 winners in Ireland and Britain, but he missed out on the Irish Jump trainers' championship on the final day of the season by less than €200,000. This season, Elliott has enjoyed his best tally of winners with 214 winners in Ireland and Britain and he leads Willie Mullins in the Irish Jump trainers' championship, 194 to 183 on March 28. He will set a new record for the number of winners in an Irish Jump season in 2017/18, having surpassed the previous best of 193 (set by Willie Mullins) at Downpatrick on March 25. For the second season in succession, Elliott emulated one of his mentors, Martin Pipe, as the only other Jump trainer to saddle more than 1,000 runners in a season. First winner as a trainer - Arresting, Fugro-Technip Handicap Hurdle, Perth, June 11, 2006. Randox Health Grand National Record: 2007 SILVER BIRCH (WON); 2009 Silver Birch (FELL 22nd); 2010 Backstage (UR 20th); 2011 Backstage (10th); 2012 Tharawaat (8th), Chicago Grey (BD 5th); 2013 Tarquinius 8th, Chicago Grey (PU 30th); 2015 Cause Of Causes (8th); 2016 Ucello Conti (6th) 2017 Cause Of Causes (2nd), Roi Des Francs (18th), Ucello Conti (UR 22nd).